our 25 year Adped Guarantee. Using Grout Backer Rod and your favourite external tile grout. What is the PorcelQuick Adped System? 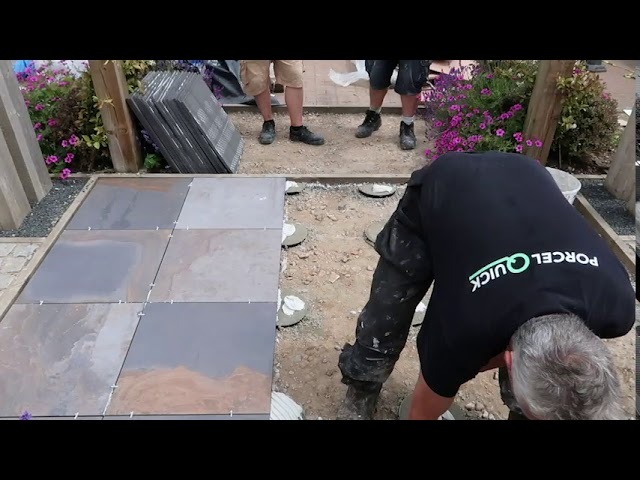 PorcelQuick (patent pending) is a system for installing 18mm+ thick outdoor porcelain tiles onto patios and terraces that will be subject to foot traffic. The unique system creates a series of pedestals that can be built up to the required height using a mix of sand & cement and Adped rings. Once the pedestals have been created, the tiles can be fixed using a traditional tile adhesive. Not only does this system dramatically reduce the number of materials required, it also results in a reduction in carbon footprint by up to 80%. 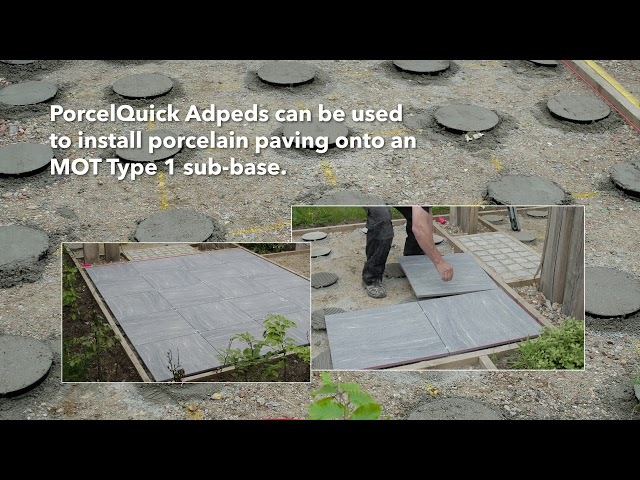 PorcelQuick Adpeds are patent pending adhesive pedestals designed to save you time and materials when installing outdoor porcelain. The Adped rings are made from a high impact polystyrene material that is lightweight and easy to transport to site. Each ring measures 250mm in diameter and can be easily snapped into halves and quarters to accommodate edges and corners. 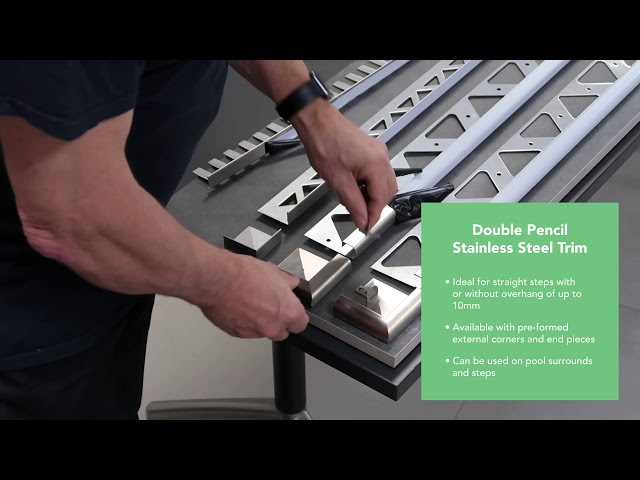 We run through the different options when it comes to PorcelQuick stainless steel trim for edging porcelain paving and outdoor tiles. The PorcelQuick Adped system was used here to install a display of porcelain paving. The Adped system has been designed to speed up the installation process, reduce cost and reduce the loading out requirement for the fixing bed by 80%. Simple, quick fixing system for thick porcelain to patios and terraces subject to foot traffic. Strong, able to take loads of 1000KG. Click here to find out more about our Guarantee. For distribution enquiries, more information, or if you have any questions, feel free to contact us below. PorcelQuick is available in a number of stockists. Thick porcelain tiles offer advantages over concrete or stone patios. Porcelain tiles are made to much finer engineered tolerances, particularly if rectified which allows them to be laid with joints as tight as 2mm. This provides a much more contemporary look that co-ordinates with modern styles, but different techniques need to be used to fix and grout. Traditional wet bed methods will be time-consuming and back-breaking in achieving a lip free and smooth finish. Admixes must be used to ensure the mortar adheres to the non-porous porcelain tile to avoid adhesion failure.